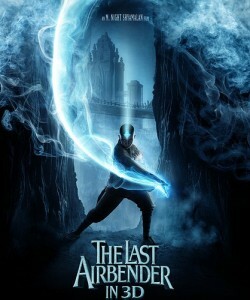 As a story that centered on a mythical version of Asia, with an Asian set of characters, Avatar: The Last Airbender was one Nickelodeon‘s most successful television shows. Sadly, the movie version of this popular television series that recently hit cinemas — directed by M Night Shyamalan and produced by Paramount pictures — falls far short of the original. The Last Airbender (the movie version) uses the tired old practice of Hollywood yellowface, in which Asian characters are swapped out for white actors. With the exception of two characters, the The Last Airbender‘s cast should be entirely Asian. Reuters writes that the original Nickelodeon series was “wholly and inarguably centered on Asian (and Inuit) culture,” yet somehow, the film’s producers missed the memo. Someone needs to tell Paramount that while the word “Caucasian” may include the word “Asian” in it, casting white actors as Asians still doesn’t make sense. There’s little justification for not casting Asians in The Last Airbender. Sure, casting Asian actors wouldn’t necessarily make the movie better. But doing so would certainly give the film more appeal and authenticity. And unlike the dud Prince of Persia, which cast popular white actor Jake Gyllenhaal to play the Persian prince as a clear marketing attempt, the white actors The Last Airbender recruited to play Asian characters are lesser-known. It might be unfair to have different expectations for M Night Shyamalan — the movie’s South-Asian director — merely because of his ethnic descent. Still, it’s sad to see him produce a film that stoops to Hollywood yellowface like this. Though who knows, maybe M Night has a positive message for white American teenagers in this movie: you can work hard and be like your Asian peers too. It’s also disappointing that Shyamalan chose to cast the film’s South Asian actors Dev Patel and Aasif Mandvi in questionably villainous roles. Though it isn’t fair to say that the movie’s heroes are all white and the villainous characters are all dark-skinned — the characters are far more complex than that — the The Last Airbender‘s promos clearly present a white avatar as the film’s last great hope. The reviews are slowly trickling in now, not all of them complimentary. The silver-lining in all of this? At least Paramount can’t blame any Asian lead actors for the dismal performance of their yellowface film. Next → Next post: Why Is the White House Leaving the New Black Panther Party Alone?